What’s the Big Idea? All will come clear soon…keep reading the blog! Meantime the ‘I Love Kirknewton’ consultation is ended (bar meeting with the high school kids) and all the information is being collated for a series of feedback sessions in March. A big thank you to everyone who helped to let people know about the consultation and to those who gave their views to help inform the first stage of the community plan. There is a second step (more soon, I’ll be in touch) and all will come clear by the end of this week! There has been a flurry of activity by the Development Trust for events in March. There is a ‘Meals and Wheels’ event in the Village Park towards the end of March that the Powerdown team are busy putting together. This event brings together the best bits of the Sustainable Transport/cycling event and the Food Fair from last year. There is the launch of the food waste trial and many people in the village have been putting their names down as ‘bin champions’ for that. 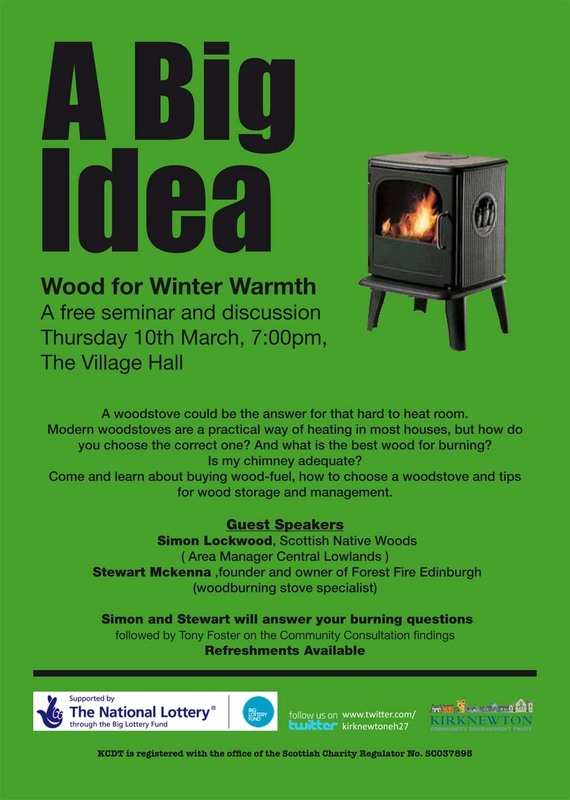 There will also be a seminar on the benefits of woodstoves for heating your homes on Thursday 10th March. I’ll also be giving a short presentation on the initial findings of the ‘I Love Kirknewton’ community consultation. Look out for further information on the Facebook group and in Konect magazine.